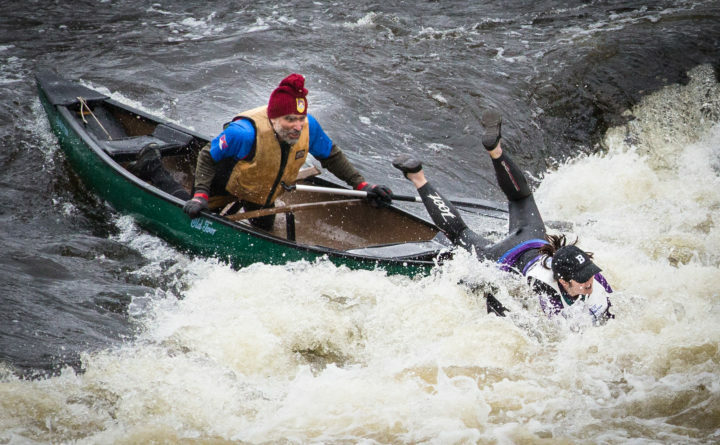 Oriana Farnham goes into the water as her paddling partner, Frank D'Alessandro, watches at Six Mile Falls in Bangor on Saturday during the 52nd Kenduskeag Stream Canoe Race. KENDUSKEAG, Maine — The scene was vastly different when Zip Kellogg paddled in the inaugural Kenduskeag Stream Canoe Race. Back then, in 1967, Kellogg was one of just 51 competitors manning 32 canoes. His latest 16.5-mile journey from the Mystic Tie Grange in Kenduskeag to downtown Bangor found him part of a now-typical throng of 454 watercraft and 852 paddlers for the 52nd annual edition of the race. ‘It’s a big crowd here, obviously, and it’s that way every year now,” said Kellogg, a retired research librarian and resident of Newcastle who has raced here nearly every year since the event started. 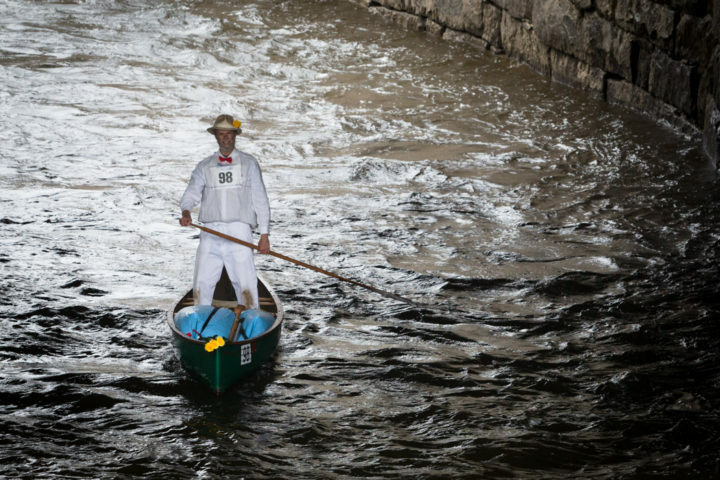 Kellogg’s race-day persona, one of making his way downstream while standing in his canoe and nattily dressed complete in bow tie, has made him one of the legends of the event. Maine paddling icon Zip kellogg makes his way into downtown Bangor on Saturday during the 52nd Kenduskeag Stream Canoe Race. But that persona, which stems largely from being seen at the start of the race or navigating the white water at Six Mile Falls, doesn’t tell the entire story. “Some people think I stand all the way but I don’t,” he said. “I sit a fair amount and I kneel a fair amount. I stand mostly in the rapids just because it’s helpful for me to see ahead where I need to be, to see where in the river is the best choice. Something that hasn’t changed — at least for the last decade — is the event’s top speed demon. Trevor MacLean of Dartmouth, Nova Scotia, posted the fastest overall time for the 10th consecutive year and 14th time in race history. A 41-year-old flatwater specialist who was competing in his first race of the spring, MacLean narrowly missed his seventh sub 2-hour Kenduskeag clocking. He navigated his 17-foot-long, 16-inch-wide solo kayak to a time of 2 hours, 48 seconds over a medium high water level. That topped two other kayakers, Ben Randall of Sabattus (2:08.13) and Harpswell’s Hank Thorburn (2:14:51), in the overall standings. “I felt pretty strong,” said MacLean. “The first 10 miles were pretty decent, it was good water so I was just trying to stay steady and put pressure on the entire way. MacLean won his class, but his fastest overall time does not earn him a separate trophy because of the diversity of the watercraft amid the 23 different classes of competition. 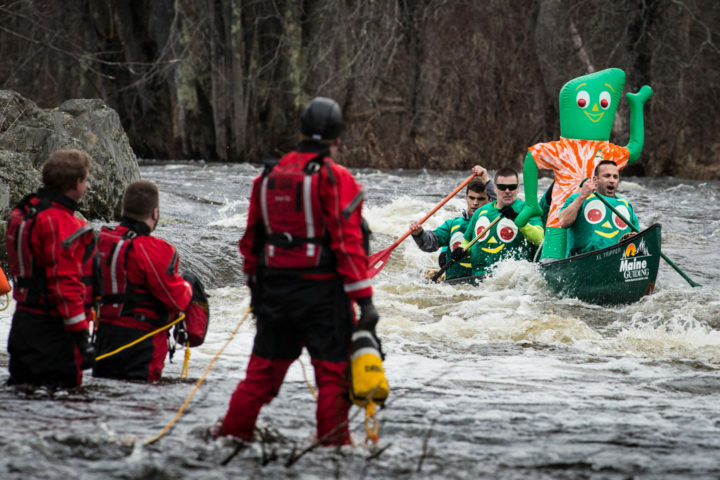 A canoe with a giant, inflatable Gumby shoots the rapids at Six Mile Falls in Bangor on Saturday during the 52nd Kenduskeag Stream Canoe Race. Another Kenduskeag staple is the “Gumby” canoe, which since 1986 has included several paddlers along with an inflatable version of the green clay animation figure that debuted on the Howdy Doody television show in the mid-1950s. “In 1985 Larry (Doucette) and I decided we wanted to do the race for the first time, we were young guys so we hopped in and did it,” Daryl Boyington of Hampden said. “We thrashed all over the place and had a hard time, so we said if we can’t be fast we’ll be funny. 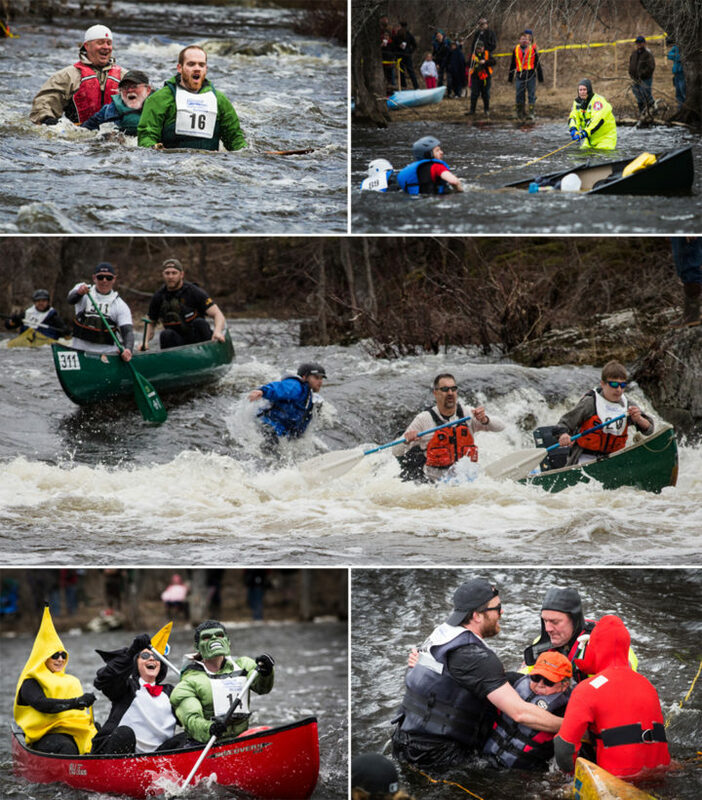 One thing Gumby, Kellogg and the other paddlers and spectators who flood this small town on the third Saturday of each April share is their vision of the Kenduskeag race as a rite of spring in eastern Maine. The scene at Six Mile Falls in Bangor on Saturday was full of spills and chills during the 52nd Kenduskeag Stream Canoe Race. Saturday’s conditions offered considerable promise — a cloudless sky at the race’s outset, temperatures in the mid-40s and a northwest breeze at the paddlers’ backs. Securing a fast time is the goal of some in the field, but most of the participants ultimately define success more like Kellogg. 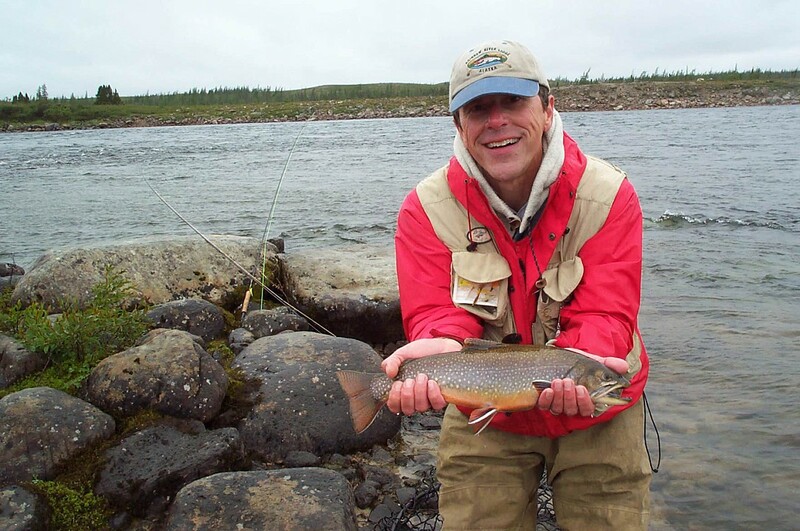 “There are some serious racers here and others like me that just want to get down the river and have fun,” Kellogg said. “It’s a nice day to be outside, and for a lot of people it’s kind of the first really good chunk of a spring day they can get outside. 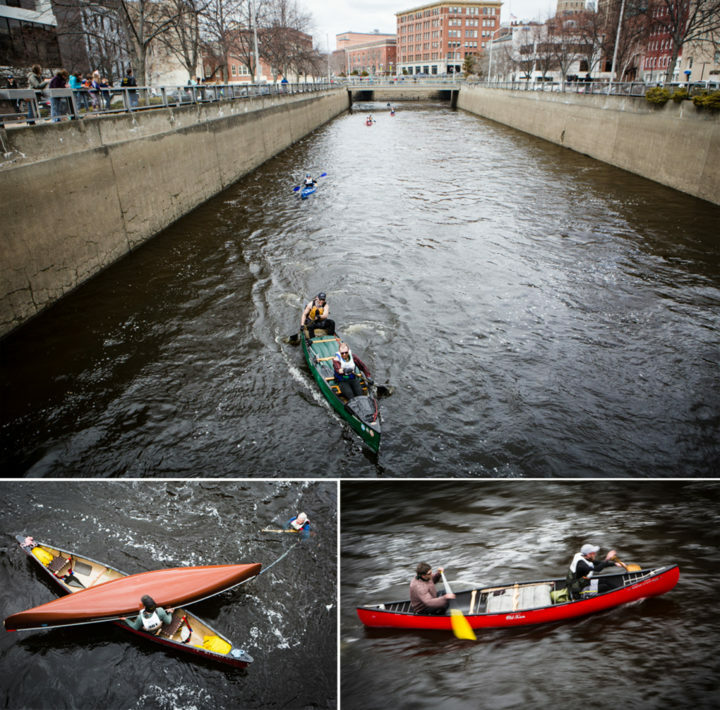 Paddlers (above top) approach the finish line in downtown Bangor on Saturday during the 52nd Kenduskeag Stream Canoe Race. One paddler (above left) rescues another near the finish line. A red canoe (above right) races to the finish line.